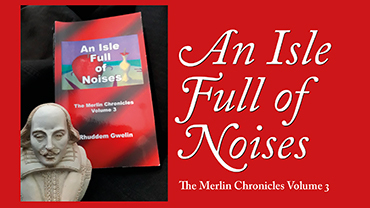 Welcome to this special event with Rhuddem Gwelin, author of the Merlin Chronicles, and Ruby Jand, author of Shakespeare Calling – the book. Ruby will talk about Shakespeare and magic in the time of Elizabeth I. Rhuddem will read excerpts from An Isle Full of Noises in which the magic of Merlin meets the magic of Shakespeare. Merlin and Shakespeare – finally!